Much cloud infrastructure consists of small, specialised services that interoperate via protocol interconnects such as HTTP. Managing these service deployments currently requires large operating system and application stacks with ad-hoc configuration management. 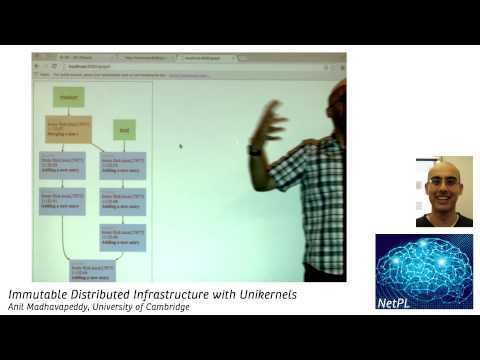 In this talk we explore an alternative approach that builds tiny specialised protocol VMs known as “unikernels”, and coordinates them by means of our “Irmin” mergeable datastructure library. These datastructures can be manipulated much like Git (with pull, push and merge operators), and form higher level control structures for persistent work queues, key-value stores, with well-defined consistency properties. Our initial prototypes using the MirageOS can be compiled to Xen unikernels, and debugged and introspected using the standard “git” command line tools. Anil Madhavapeddy is a University Lecturer at the University of Cambridge, based in the Systems Research Group. He was on the original team that developed the Xen hypervisor, and helped develop an industry-leading cloud management toolstack written entirely in OCaml. Prior to obtaining his PhD, Anil had a diverse background in industry at Network Appliance, NASA and Internet Vision. He founded and directs the OCaml Labs group (ocaml.io) at Cambridge, and leads the MirageOS unikernel Linux Foundation incubator project.